The SAG Awards featured a number of memorable moments on Sunday night, all broadcast from the ceremony hosted by Megan Mullally. However, there were also plenty of memories created behind the scenes by nominees, presenters and audience members alike. This unique award show is the only one that solely honors performers for their craft, with actors recognizing actors for the work they’ve put in during the last year. As such, these behind-the-scenes SAG Awards photos are extra special. We’ve rounded up some of the best behind-the-scenes pictures you may have missed from the SAG Awards, because trust us — they’re worth the attention. Prior to the SAG Awards ceremony, John Krasinski shared a super-sweet photo with his wife, Emily Blunt on Twitter, captioned, “Honored to be on the arm of this double nominee tonight!” Now, Blunt is a winner. She took home the trophy for best performance by a female actor in a lead role for her turn in Krasinski’s filmmaking debut, A Quiet Place. During her emotional acceptance speech, she made sure to call out her husband and their two daughters from the stage. Prior to the show on Sunday, Danai Gurira tweeted “A little sneak peek…” of her dress for the ceremony, in which she looked absolutely stunning, just before she and her Black Panther castmates made history by taking home the award for best ensemble performance by a cast in a motion picture. Crazy Rich Asians star Gemma Chan tweeted a snap of her dress, captioning it, “Last looks…” Stunning! Keeping it old school today. SAG prep!!! Before she and hubby Sterling K. Brown celebrated This Is Us’ second SAG Awards win, Ryan Michelle Bathe hit the salon for some “old school” prep for the show. Although A Star Is Born went home empty-handed on Sunday night, Bradley Cooper and Lady Gaga were all smiles as they hugged between awards and posed for pictures. 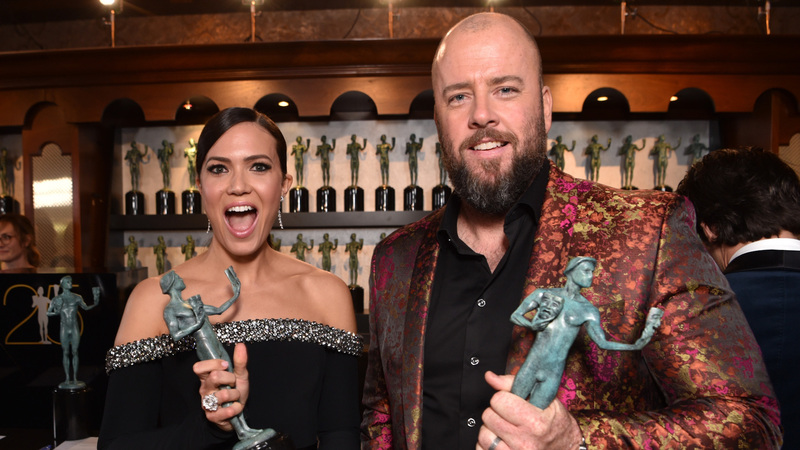 Mandy Moore shared a series of photos showcasing her custom-made sparkly dress and thanked designer Jason Wu and her friends for helping her get dolled-up for the event. Lupita Nyong’o also shared a series of photos to showcase her SAG Awards look as well as photos and videos with her Black Panther castmates saluting Wakanda with their statuettes in hand. Ahead of the SAG Awards ceremony, Glenn Close joined a slew of other stars who gave fans a sneak peek into their getting-ready routine. Amy Adams’ husband, Darren Le Gallo, shared a striking black-and-white photo of the star standing on a balcony overlooking the city. “Proud of you and congratulations to all the actors [sic] work that was acknowledged by their peers this evening,” he wrote.